Mobile gaming is no longer considered as indie friendly as it was in the past. While the free charts are swarming with small developers, it sometimes seems that the giants of the top grossing charts have sucked up all the oxygen in mobile—or perhaps all the optimism. But mobile hasn’t run out of fresh ideas yet. Some “niches” in the industry are worth millions, or even billions. 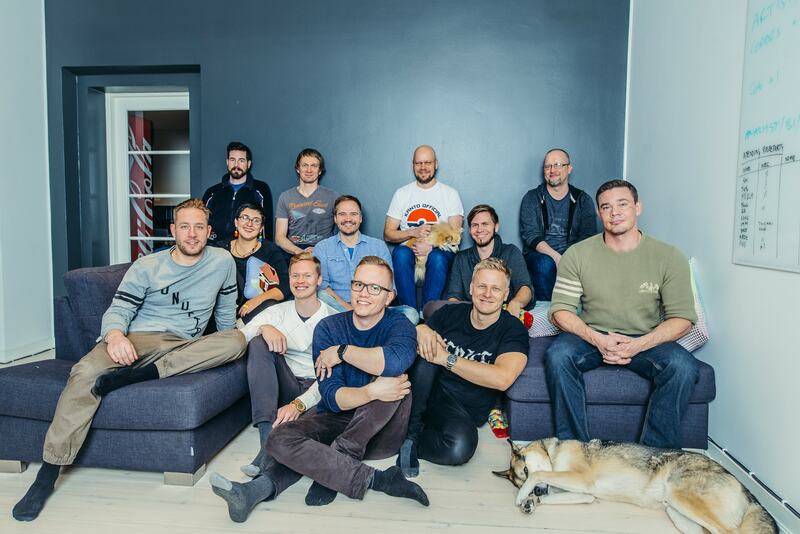 Mobile games built around an ad-based business model is the largest of these niches, harboring innovative startups like Helsinki-based Futureplay Games, whose founders boast the same creative DNA as the founders of Supercell and Rovio. Futureplay calls its particular business model “view-to-play.” It’s a design that’s outwardly similar to free-to-play, but crucially, in a view-to-play game the ads come first. Players aren’t encouraged to pay; rather, they’re asked to watch rewarded video ads. Two years after starting, Futureplay has a pair of successful games, 18 employees, and three more games in the pipeline. In this exclusive interview with Fyber, CEO Jami Laes walks through Futureplay’s surprising secret to its success. In 2017, it’s undeniable that some segments of free-to-play games are filled with powerful incumbents. For new mobile game startups that want to build a multiplayer strategy battle game, or Hearthstone-style card game, or even a match-3, they may be in for a rude awakening. But these are just segments in a very large industry that, according to Laes, has some sizable blind spots. Games that compete with the powerful genres of mobile gaming—multiplayer strategy battlers, Hearthstone-style card games, and match-3—are just the most visible islands in an ocean that’s still fairly blue, says Laes. “Looking at the numbers, [mobile] ads were a $100 billion market in 2016 and nobody was focused on it. That sounded to us like we had a new angle,” he says. In mobile, and even outside of it, everyone knows the name Flappy Bird. The notoriously simple game, created by an unknown developer in Vietnam, shot to the top of both the free charts and pop culture consciousness in 2013, bringing in tens of millions of downloads and, reportedly, over $50,000 per day in ad revenue for creator Dong Nguyen. The chatter in the game industry revolved around how such a barebones game had gotten so many downloads. But in retrospect, Flappy Bird was a harbinger of view-to-play. Over a year later, Crossy Road proved the ad-based business model again, alongside smaller games like Mr Jump. And Laes saw yet another sign of change in 2015: At GDC, advertising companies were changing their pitch from “we can get you installs” to “we can earn you money.” By then, Laes and his co-founders were hard at work on their business plan, but they still hadn’t seen the full potential of rewarded video ad monetization in mobile games. Based on the performance of arcade games like Cross Road, Futureplay’s founders thought they’d need to make up to 24 games per year. But the number of games quickly dwindled as they began to consider genres beyond just arcade: from 12, to six, then three games a year. 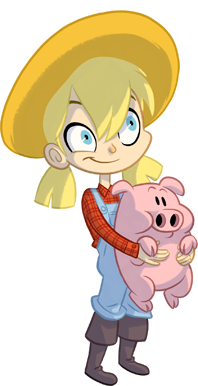 Ultimately the company settled on the incremental (also called idle or clicker) genre as the perfect fit for view-to-play, creating just two management games in its first two years: Farm Away and Build Away. The games have been a rousing—and lasting—success for the studio, yet view-to-play remains a relatively unoccupied niche. Making ads part of the gameplay and core design philosophy for both titles has been key to Futureplay’s success with its view-to-play monetization model. Prior to rewarded video, most in-game ads were an unwanted consequence of playing: screen overlays after a death, for instance, or timed pop-ups interrupting gameplay. In view-to-play, the opposite often holds true: rewarded video ads are optional, and entice players by opening up new gameplay modes or rewards. 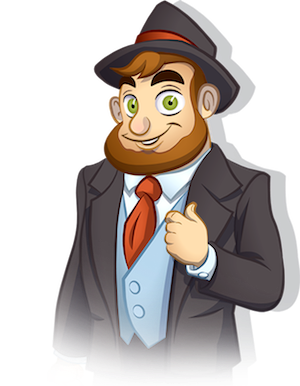 In Build Away, for instance, players can tap on an air balloon to trigger a coin collecting frenzy. The air balloon only appears after the player has spent a couple of minutes playing, unobtrusively occupying a corner of the screen. In Farm Away, prices of crops and land scale up quickly into millions, billions, and trillions of dollars, but rewarded ads keep users ahead of the exponential curve by multiplying earnings. 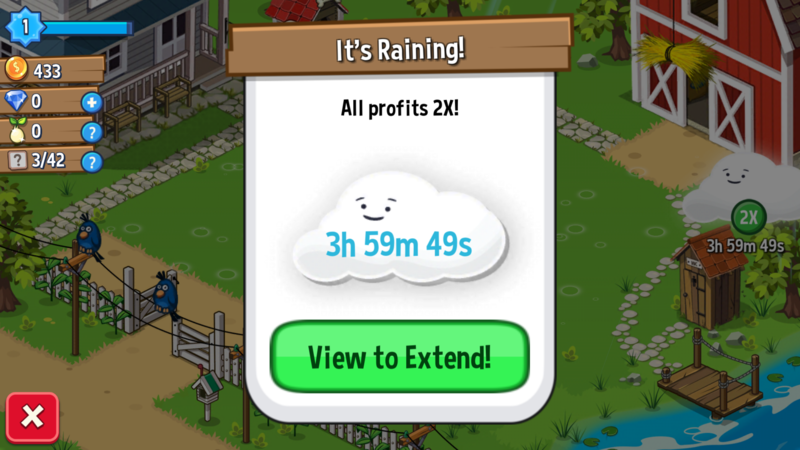 Tapping on a rain cloud can give players a boost of a few hours, but many choose to watch 4-5 ads in a row, receiving up to 24 hours of boosted production as a reward. Multipliers, speed-ups, and bonus earnings are a boon for resource management games like Farm Away and Build Away. These games are notoriously difficult to balance in order to maximize earnings from in-app purchases; ads allow more wiggle room, and allow for the win-win proposition of delivering revenue to developers every time users choose to speed ahead, without paying a dime. Among Futureplay’s user base, the choice to watch a video ad happens quite often. In particular, Farm Away and Build Away draw an 80% ad engagement rate with rewarded video. It can take years of experience to reach the point of being able to “see change,” as Laes puts it. Later, Laes ran into Ilkka Paananen—a famed name today, as he’s the CEO of Supercell. At the time, Paananen was the co-founder of Sumea, a lesser-known but still successful developer of Java and J2ME games for feature phones. Paananen suggested that Laes’ experience as a TV producer might transfer well. “I wish I could have been in games from the beginning,” Laes reminisces. 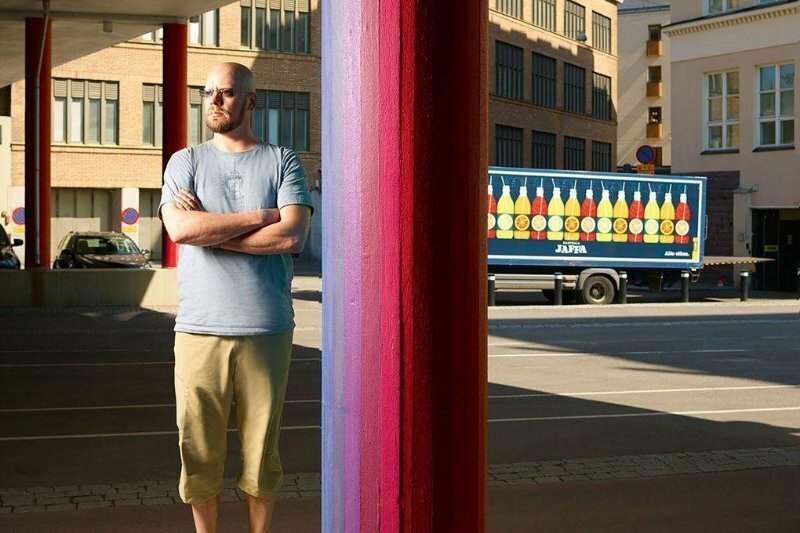 Laes followed Paananen to Digital Chocolate, during the Facebook games era, and later worked stints at Playfish and Rovio. It was at these companies that he developed his feel for the hidden opportunities of gaming. “It feels like there are a lot of things that deteriorate with size in big companies,” says Laes. 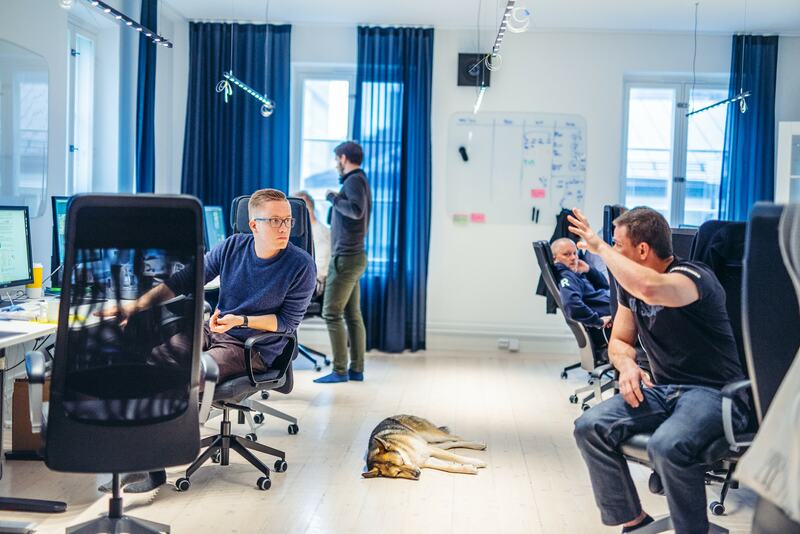 “The bigger you are, the harder it is to react to changes.” In part, it’s the Finnish industry that’s figuring out how to avoid that sort of decline. “Modern CEOs try to get out of the way as much as possible and let the people really doing work do their magic rather than try to control everything,” Laes notes. The more Futureplay grows, the more Laes spends his time on the outside, interfacing with investors and partners, and studying the company’s performance against the larger app market to make sure of direction. Futureplay’s philosophy of launching games revolves around the minimum viable product (MVP). Building a lean MVP and launching it as fast as possible used to be gospel for the mobile industry. Nowadays, it’s heard less often: Anyone competing with the top companies had better build a large, fully-featured game, only to soft launch it for months in order to decide if the game is a commercially viable product or not. But for companies like Futureplay, an MVP is still perfect.